All eyes are on Otoson Uchi as the Hantei family line has been shaken up like never before. While the imperial City is the focal point for these dramatic events, strife is infesting Rokugan from all angles. The Emerald Empire is breaking down into chaos, who will you support? Step into the world of Rokugan with Justice for Satsume the third Dynasty Pack in the Inheritance Cycle for Legend of the Five Rings: The Card Game! 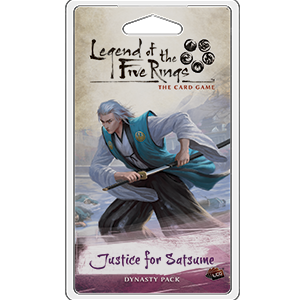 Justice for Satsume continues the themes of the Inheritance Cycle, placing an emphasis on Courtiers and Bushi ,introducing a new Disguised character ideal for surprising your opponent, and two Clan Champions!